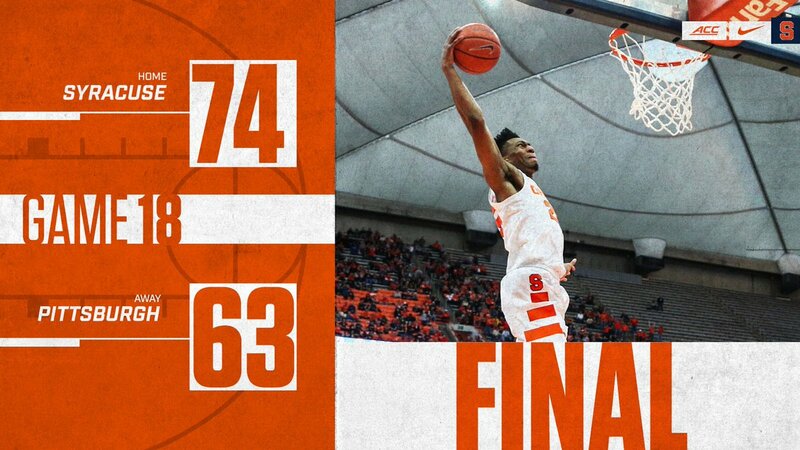 In front of the largest on-campus crowd in the NCAA this season, Syracuse (13-5, 4-1 ACC) tied a season-high 12 three-pointers on its way to a 74-63 victory over Pittsburgh (12-6, 2-3 ACC) Saturday afternoon at the Carrier Dome. The 24,466 fans in attendance saw the Orange move to 4-1 in the ACC after winning six of its last seven games. Tyus Battle went 9-of-17 on the day for a game-high 21 points that also included three rebounds, two assists and two blocks. A stellar 4-of-5 shooting performance, all from three-point range, led freshman Buddy Boeheim to a career-high 13 points. Oshae Brissett and Frank Howard rounded out the four players in double-digits with 11 and 10 points, respectively. Following a career-night on Monday against Duke, Paschal Chukwu did not disappoint snatching 11 rebounds today. Saturday marked the third time in his career with back-to-back double-digit rebound performances, and the first this season. He also added six points and three blocks. Pittsburgh was led by the scoring duo of Jared Wilson-Frame and Xavier Johnson who contributed 19 and 17 points, respectively. Wilson also pulled in eight rebounds on a 7-of-14 shooting performance.